B2C robo-advisors are grabbing headlines, but B2B fintech players giving FIs competitive digital-advisory toolkits are the ones to watch. London, 19 September 2018 – With new-era digital wealth management solutions springing up in Europe and taking customer experiences to a whole new level, the traditional wealth management sector in the region is experiencing a shift in fundamental power dynamics and revenue generators like never before. To make this shift easier for financial institutions, a number of business-to-business fintech firms have emerged that are providing them with digital toolkits to enhance their capabilities, enable them to capture a greater business opportunity, and create value for investors in a time- and cost-efficient manner. 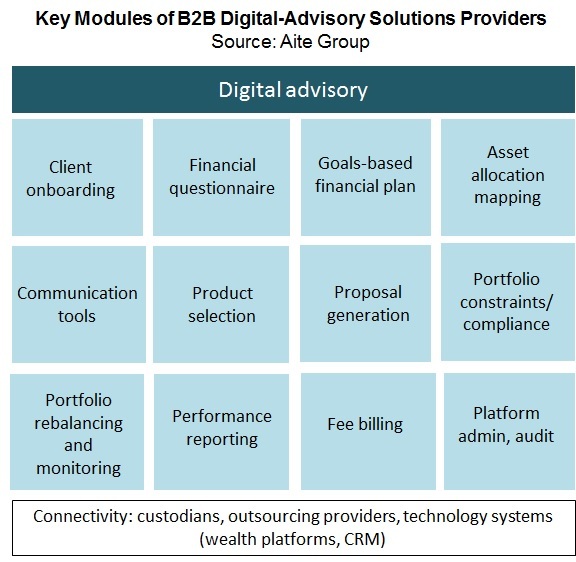 This report profiles 17 Europe-headquartered firms that are providing B2B software solutions that enable FIs to launch their own white-labeled robo-advisory or digital-advisory capabilities. It is based on 17 primary interviews conducted between March and June 2018 with executives at the following fintech firms across Europe: additiv, CREALOGIX, Elinvar, ETFmatic, Exaxe, FA Solutions, Fincite, meetinvest, Saffron Robo, swissQuant, TechRules, True Wealth, WeAdvise, WealthKernel, WealthObjects, Wealth Wizards, and Whitebox. This 49-page Impact Report contains four figures and 25 tables. Clients of Aite Group’s Wealth Management service can download this report, the corresponding charts, and the Executive Impact Deck. This report mentions ABN AMRO, Acorns, Acorn Life Additiv, Allianz Suisse, Aviva, AXA Life Invest, Basellandschaftliche Kantonalbank, Betterment, BlackRock, BNP Paribas, Capita, Comdirect, Consorsbank, Coutts & Co., Crealogix, Deka Gruppe, Deutsche Bank, Donner & Reuschel, Elinvar, ETFmatic, Eureko Group, Exaxe, FA Solutions, Fincite, Five Degrees, Fondita Fund Management Company Ltd, Fürstlich Castell’sche Privatbank, Investec Wealth & Investment, JAM Advisors, JM Finn, JP Morgan Asset Management, Killik & Co, Liverpool Victoria (LV=), MeDirect Bank, meetinvest, Mercer UK, M.M.Warburg &CO, NatWest, Nutmeg, Ortec Finance, Prospery, Raiffeisen, Royal Bank of Scotland, Saffron Robo, Scalable Capital, Société Générale, SP Capital, St. Galler Kantonalbank, swissQuant, TechRules, Tilney, True Wealth, UBS, UB Asset Management, unblu, Virtual Affairs, Volkswagen Bank, WeAdvise, Wealthfront, WealthKernel, WealthObjects, Wealth Wizards, Weltsparen, and Whitebox.